The goal of our paddle mixers is to make them the most effective solution for all industrial applications that require mixing solids and pastes effortlessly. We are pleased to introduce our line of new industrial paddle mixers. 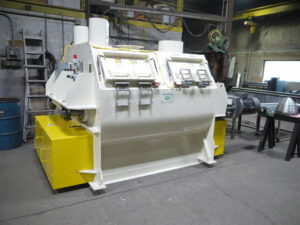 A&J Mixing customizes all our mixers to fit your exact needs & many other options are available. We will work with you to prove we are “good people to mix with” , no matter what the industrial application you are looking forand give you the best return on your investment. Our paddle mixer’s 30 second to 1 minute mix time allows for a greater throughput in a smaller footprint. A&J paddle mixers allow for a perfect mechanical blend of 1/2% standard deviation. Mix fragile or shear-sensitive materials without having to worry about degradation with a noshear paddle. Our no shear paddle design allows for shear sensitive material mixing without degradation. Our patented Shearmaker design can introduce any shear for mixes that need the predictable introduction of shear with a low temperature rise. Liquid additions with industry leading accuracy and speed, allowing for greater throughputs. 30 Second – 1 Minute Mix Time. Call or email our team today for more information & a quote for your next paddle mixer. A&J Mixing also offers product demonstrations on-site or at our warehouses. Contact us for more information about demonstrations. Mix to 1/2% standard deviation and Cv 5% while maintaining speed and accuracy. Flush air operated discharge door with no dead spot. Ensures that every ounce of material is mixed and none is wasted. All air devices piped to a solenoid bank with a lockable disconnect for safety and ease of installation and maintenance.